Every Sunday night, after I get home from work, I sit on the couch, relax and watch a little T.V.. One of the shows I watch is Fear the Walking Dead on AMC. It's really not as good of a show as I think it could be. I tune in every week expecting it to get better, and every week I'm left disappointed. But, AMC advertising the hell out of their new show, Preacher, that premieres on May 22nd, and I have to say, I'm pretty psyched by what I'm seeing so far. To be honest with you, I didn't really know much about the Preacher comics until I saw the commercials for the new show. I pretty much only knew that the comics existed. I new nothing of the characters or the story, but after seeing what AMC has in store, I had to check it out. So far, I've only read this comic. 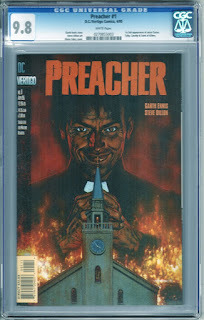 I can understand why DC decided to put Preacher under their Vertigo label. Vertigo is a branch of DC Comics that deals with more graphic and adult orientated stories, and from what I've read so far, this series fits the Vertigo label perfectly. Preacher was created by writer Garth Ennis. He has a long list of writing credits, including Hellblazer. He was also co-writer of the 2005 movie Constantine, staring Keanu Reeves, which was based off of the Hellblazer series. When we first meet our trio of characters, they are sitting in a diner rehashing the story (for the readers sake) of how they all met. Jesse Custer is a small town priest. While he is giving a sermon in front of his congregation, he becomes possessed by a half angel- half demon entity called Genesis. Because of the possession, the church goes up in a huge ball of fire and ends up killing everyone inside, except Jesse. Tulip O'Hare is an old flame of Jessie's. For reasons I don't know, she pulls out a gun and takes aim a some old pervert in the back seat of a car and shoots off a round. She manages to shoot one of the other passengers in the back seat, blowing off the lower half of his jaw. She run away as the others in the car start to chase her. She comes up to a truck that's being driven by none other than Proinsias Cassidy. She hops in the truck and they are on their way. Tulip doesn't realize it right away, but Cassidy just happens to be a vampire. As the two are driving, they see a big plume of smoke off in the distance. When they arrive, they see the charred remains of a church and find Jesse unconscious. After Genesis escapes Heaven and possesses Jesse, The Saint of Killers is called upon to return the angel-demon back to where it belongs. I don't want to give too much of the story away, so I'll leave it there. 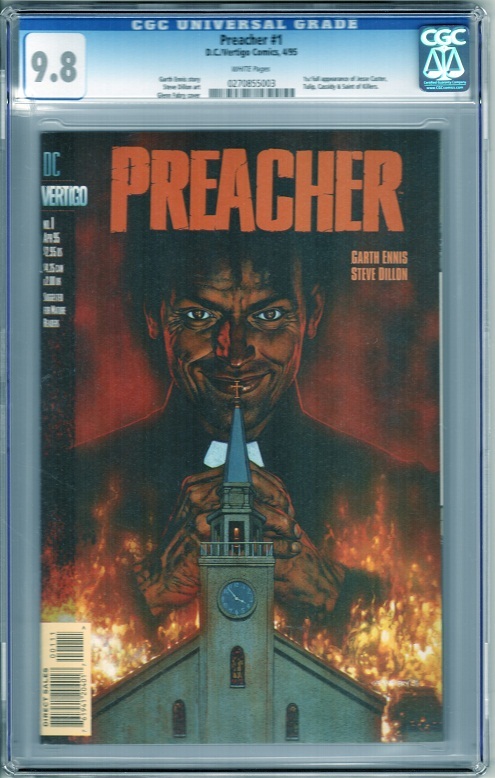 Preacher #1 is said to have a small print run. How small? I have no idea. I found one source estimate a run of about 20,000 copies, but I don't know how accurate that is, or where they got their information from. What I do know, is how many have been graded by CGC. To date, there have been 1,588 copies graded by them. Most are a high grade 9.4 or higher, but none are graded higher than 9.8. As of this writing, 439 are graded at that highest grade of 9.8. As we drop down one grade to a 9.6, there are 446 copies CGC graded. For a modern comic that came out in 1995, it really isn't a cheap buy. The hype from the T.V. show has made prices of high grade copies shoot up pretty high. In the course of three years, 9.8 copies have gone from around $150 to upwards of $900 and higher. 9.4 and 9.6 copies have started selling for around $400 and $500. Surprisingly, even mid grade 6.0's have gone over the $100 mark. How much higher these values will go is information I don't have. I have a feeling that we will start to see prices come down a little bit before they start to level off after all the hype from the T.V. show comes down. Unless the show takes off like The Walking Dead did, then all bets are off. Even though I missed out on this great comic investment, I'm still looking forward to reading the series. If the rest of the comics are anything like this first issue, I'm gonna be in for a real treat. Gotta admit, this comic was a surprise. It blew up fast too, like in a matter of days after the show was announced. Missed the ball on this one. You and me both. I wish I had a crystal ball so I could get these comics before they blow up like that. I'm always weary about all of these modern comics anyway. Oh well, I'm sure this isn't the last comic that I'll miss out on.